Worry is one of two components of anxiety (the other being emotionality). Worry refers to negative self-talk that often detracts the mind from focusing on the problem at hand. Emotionality refers to physiological symptoms such as sweating, increased heart beat and raised blood pressure. George Asaf [George H. Powell], 1st World War song: Pack up Your troubles in Your Old Kit-bag. Meher Baba, in Lord Meher, Volume 20, page 6742; sometimes attributed in the form: "Do your best, then don't worry, be happy." My mistake has too often been that of too much haste. But it is not the people’s way to hurry, nor is it God’s way either. Hurry means worry, and worry effectually drives the peace of God from the heart. James O. Fraser, Geraldine Taylor. Behind the Ranges: The Life-changing Story of J.O. Fraser. Singapore: OMF International (IHQ) Ltd., 1998, 189. 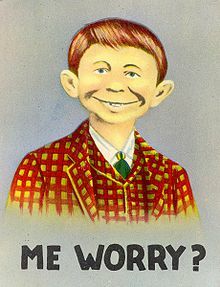 Alfred E. Neuman, in MAD # 24 (July 1955); later altered to "What, me worry?" Anxious care rests upon a basis of heathen worldly-mindedness and of heathen misunderstanding of the character of God. Be God's alone; and choose the better part. He who climbs above the cares of this world, and turns his face to his God, has found the sunny side of life. The world's side of the hill is chill and freezing to a spiritual mind; but the Lord's presence gives a warmth of joy which turns winter into summer. I met a brother who, describing a friend of his, said he was like a man who had dropped a bottle, and broken it, and put all the pieces in his bosom, where they were cutting him perpetually. Henry Ward Beecher, p. 43. Why art thou troubled and anxious about many things? One thing is needful — to love Him and to sit attentively at His feet. I have no cares, O blessed Will! Hast made Thy triumph mine. Frederick William Faber, p. 44. Most men call fretting a minor fault, a foible, and not a vice. There is no vice except drunkenness which can so utterly destroy the peace, the happiness of a home. Mrs. H. F. Jackson, p. 254. However nervous, depressed, and despairing may be the tone of any one, the Lord leaves. him no excuse for fretting; for there is enough in God's promise to overbalance all these natural difficulties. In the measure in which the Christian enjoys his privileges, rises above the things that are seen, hides himself in the refuge provided for him, will he be able to voice the confession of Paul, and say, "None of these things move me." S. H. Tyng, Jr., p. 254. Variously attributed to Dean Inge and John Garland Pollard in the 1930s, this aphorism was already in general circulation decades earlier, e.g., it features in an advertisement in The Grape Belt, 2 October 1906, p. 5.